I wonder if the drop in MCS diagnosis has anything to do with fewer doctors being aware of how to diagnose it, or the lack of support (to put it nicely) that they receive for diagnosing and treating patients with MCS? It certainly isn’t because our environments are less toxic or that we have more access to health care, or other necessary social supports available that would reduce incidence development. I’ve heard from more than a few people who know they have MCS (thanks to independent research and luck), that their doctors “don’t believe in it”, so they can’t get an official diagnosis. Interesting too about the jump in numbers of people diagnosed with FM. Perhaps the increase in FM diagnosis is due to the fact that it is now widely “recognized as real” (since a few pharmaceuticals were developed to treat some of the symptoms without causing more problems in some of the people), so maybe more people with MCS are either getting or choosing to use just the FM diagnosis (with MCS as a symptom instead of an actual diagnosis) because trying to get disability income or accommodations with MCS alone is such a nightmarish process? My own FM flares are totally caused by some kinds of chemical exposures. Unless people with FM were advised to reduce or eliminate everyday chemical exposures (by doing things like choosing fragrance-free personal care, laundry and cleaning products), and change their diets to fresh, clean organic foods, most would never know how much everyday products, materials, and foods (or food-like products) affect their pain and functioning levels. 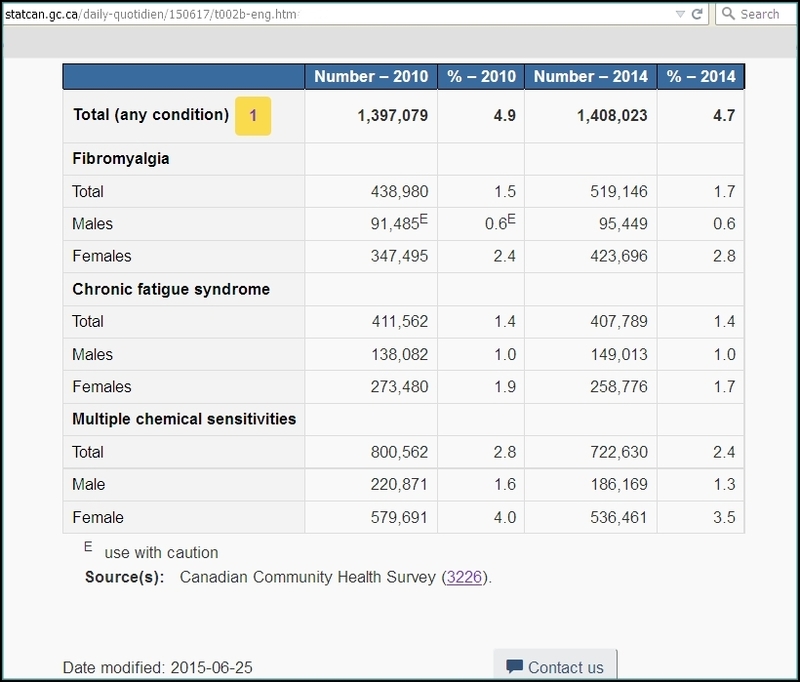 Since the Canadian Community Health Survey (CCHS) tracks MCS (they have since 2005), isn’t it time for MCS to have its own specific ICD code? Isn’t it time for all Canadian doctors to know how to diagnose and treat people with MCS, as well as offer prevention tips so that the condition doesn’t become severe and disabling? Isn’t it time for ALL medical and dental practices and practitioners to be at minimum fragrance-free so that they would be more accessible to people with MCS? Isn’t it time for ALL places and services to be accessible to people disabled from MCS? Accessible (healthy) environments would benefit everyone! 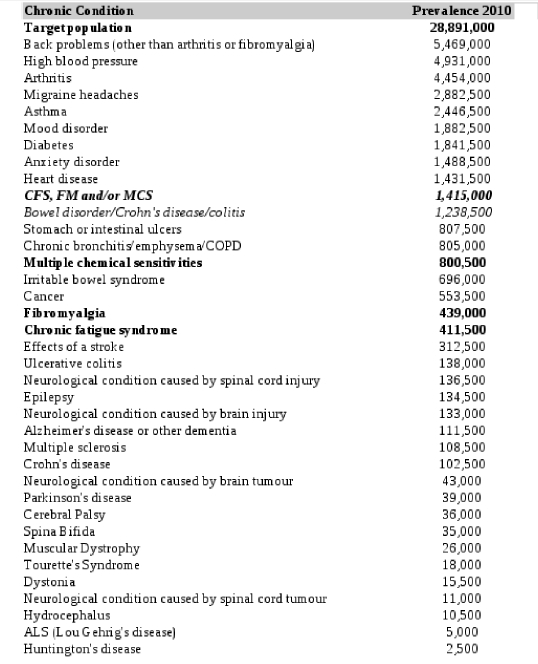 In 2010 there were more people with MCS than there were with cancer or other well serviced health conditions. 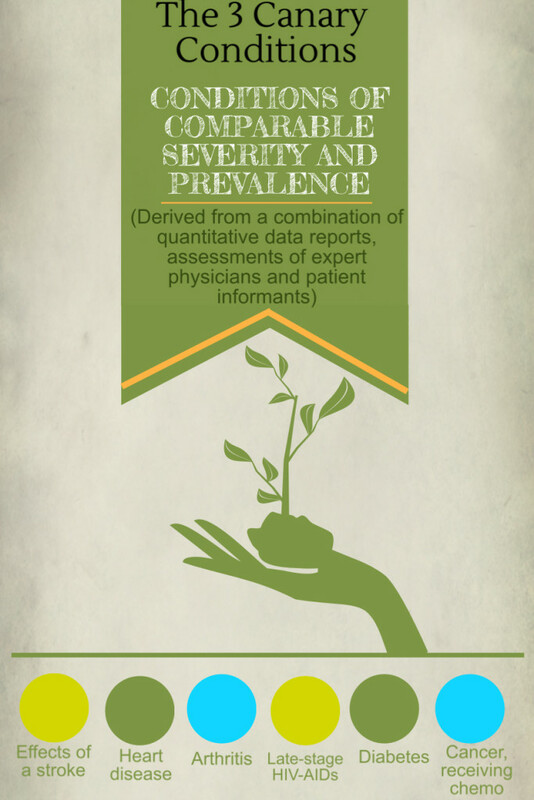 This entry was posted in Accessibility, Disability, Environmental Health, Fibromyalgia, Health, ME/CFS, Multiple Chemical Sensitivities, Public Health and tagged CFS, FM, MCS, prevalence, statistics. Bookmark the permalink. I believe it is the terminology creating the decrease. There is obviously a problem with doctors not diagnosing MCS but that has always been a problem. I would love to see a study with how many doctors diagnosed a patient with MCS and then put the official diagnosis down as something else like debilitating migraines or chronic fatigue because of an increased difficulty for the patient getting disability with MCS. It’s not a lie since the person actually has these things as a result of MCS but there is less backlash from the chemical companies or the insurance companies after seeing an upsurge in MCS in previous studies and claims. But if this is the case then it skews the stats for MCS downward when in fact they may have increased significantly. With computers now it seems it should be easy — when a doctor makes a diagnosis click a button and it goes to a site and then we know actually how many people have MCS of CF or cancer or whatever — without having to ask people. “But the law misses the first key step, Hohl says, adding it doesn’t require health-care providers to document serious drug reactions such as those that lead to hospitalization, deaths, near fatalities and congenital malformations. “There’s far less than five per cent of adverse drug reactions that are reported,” she says. Official prescribing information documents for doctors that run to 50 pages of fine print, leading many physicians to rely on drug sales representatives for their information. Changes in Health Canada’s mandate dating to 1997 that ordered the department to partner with pharmaceutical companies to help them market their drugs. A lack of independent checks into the safety of prescribed drugs. Pressure on Health Canada’s drug reviewers to get drugs to market faster, since pharmaceutical companies pay for 60 per cent of drug reviewers. Pharmaceutical company safety information is considered a commercial secret by Health Canada, as opposed to the U.S. Food and Drug Administration that makes the information available on the internet. Health Canada reviewers “view themselves as helping the companies sell drugs, which in many cases is the antithesis of public health,” Young said. It seems it so often it falls to the individual patient to insist the doctor report these issues and or the doctor caring enough to do it themselves. After watching all the TV ads for drugs and listening to the lengthy list of side effects and then listening to the lawyer TV ads wanting you to sue for adverse drug reactions — what criteria is being used to determine that they are safe in the first place? — what ever the criteria is — it seems to be failing miserably. Recalls only happen after lengthy lawsuits following deaths and major illnesses. Profits come first in this toxic economy. They know we can’t prove one chemical is the cause, because it’s the toxic cocktail. If only we could start eliminating the toxic chemicals linked to cancer instead of needing to spend millions if not billions on treating the symptoms. and/or trying to save people’s lives after they’ve become ill. But that wouldn’t be good for the (current, toxic) economy! They said the same thing about abolishing slavery in England and yet they did it without any economic repercussions. I live in the UK and last week I went to see the immunologist who diagnosed me with ME; I explained my new symptoms and he diagnosed me with MCS and FM as well, although when he sent a letter to my local doctor regarding the appointment, he only mentioned the new diagnosis of FM and not MCS. Thank you, I’ve been having treatment for ME and they offer the same treatment for Fibro as ME in the UK so I’ll continue on as I have been. My new symptoms made me think I was going crazy so I’m relieved for a diagnosis but not really a good diagnosis to have, I guess no diagnosis is good! Our body is going crazy, in red alert, trying desperately to maintain functions while under attack by all the toxic chemicals, the extreme symptoms are really the body’s defensive mechanisms. We need to see the signs not supress them or make them worse by more chemical exposures (most drugs included). You will find that you can function almost normally in a chemical/toxic free environment and see why you ‘feel like you’re going crazy’ when exposed to all the ‘neorotoxins’ that you were being ‘inadvertantly exposed’ to. Environmental Control is the key to providing yourself with a ‘safe haven’ where you are free from exposures and your body can heal and ‘detox’ lowering your ‘toxic body burden’ (the excessive toxic body burden is what causes MCS/TILT).